Climate deniers abuse volcano science to further their agenda. 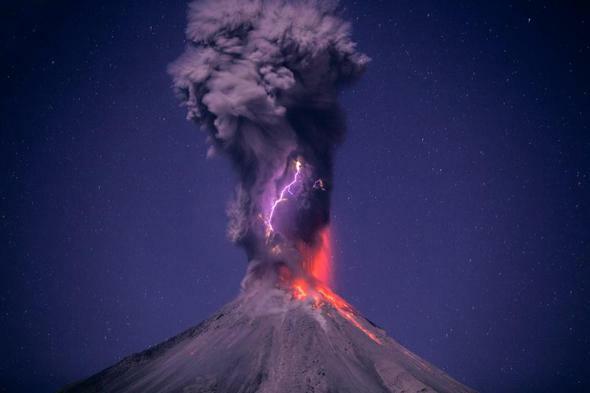 Colima erupts at night, blasting a plume of ash and gas into the air. I love the website RealClimate. Actual, working climate scientists write the articles there, and they discuss the current news about climate. They also take on the deniers, and do so in an expert and clear fashion. These claims are dead wrong; so wrong in fact that it’s difficult for me to believe that the people making them are being honest. The RealClimate article goes into the history of these claims, which is interesting in and of itself. But what I always find fascinating is how the deniers take scientific data and then dishonestly alter them to sound reasonable. For example, volcanoes put chlorine into the atmosphere. Deniers then compare that to human outputs of chlorofluorocarbons, or CFCs, which damage the ozone layer. But even if a single volcanic eruption put out more chlorine than human activity in a year (and they generally put out far less), the chlorine is in the form of hydrochloric acid (HCl), which is water-soluble and rains out almost immediately. CFCs are much hardier molecules and stay in the atmosphere for long periods of time. Both have chlorine, but they are very different molecules, with very different behaviors, and therefore very different effects. Comparing them is shaky at best. I always laugh ruefully when I hear deniers talking about volcanic emission of carbon dioxide, too. They tend to exaggerate it hugely; in 2015 Mike Huckabee claimed that a single volcano puts out as much climate changing gases as humans do in a century. That’s utter crap. Volcanoes emit about 250 million tons of CO2 on average per year. Humans emit 40 billion. Billion, with a b, more than 100 times as much as volcanoes. Even a huge, catastrophic volcanic eruption emits far less CO2 than humans do in a year. What Huckabee said was just made-up nonsense. Since he clearly has no idea what he’s talking about, yet he states it as a fact, it wouldn’t be too out-of-school to say he was lying about it. Which brings me to the point I make over and again: If global warming is such an obvious hoax, why are deniers constantly so dishonest about it? Why not present the facts as they stand, instead of lying about them, distorting them, being misleading about them, cherry-picking them, and concocting conspiracy theories about them? Why, it’s almost as if they have no facts, no data to back up their claims, so these dirty tactics are all they can muster.